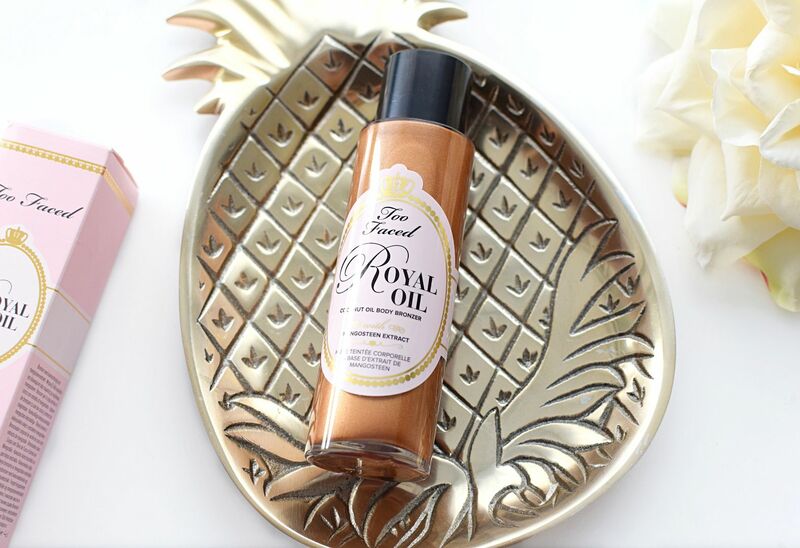 If you are out celebrating the Queen’s 90th birthday this weekend, then you might want to bronze it up and I can think of no better way than with Too Faced’s Royal Oil. Sorry that was a really bad connection, but trust me you will definitely want this the next time you are out partying or want to up the ante with the bronzing. Ever wonder how celebrities legs looked so tanned and perfected, like no dodgy marks and smooth glistening legs? Well they no doubt use a bronzing oil. I am currently obsessed with Too Faced’s Royal Oil. Not only does it smell of coconut which is just amazing, it gives you the best bronzing you may have had in your life. The bronze colour adjusts to your skin tone and will make your skin look super smooth and glistening. It only really glitters in the light, so say in the bathroom light, so don’t panic it’s not like you have covered yourself in an 80’s glitter body lotion. The colour is amazing, I was a bit skeptical at first and figured I’d just end up orange, but it made me look like I’d had three weeks in the Maldives and better yet it doesn’t rub off. Even with water it was quite a test, but of course it will come off, I just mean it doesn’t come off easily. I would quite like to know what it’s like wearing this with white clothing, I am too scared to try that out, but otherwise I am loving it. Royal Oil also nourishes the skin with coconut oil and antioxidant-rich Mangosteen fruit. My skin not only looks smooth but feels super soft too. I’m really tempted to take this on holiday for the evenings just to top up the bronze on my legs. You have to try it, seriously you will feel like a bronzed goddess. Too Faced Royal Oil is £26 and available from www.toofaced.com.